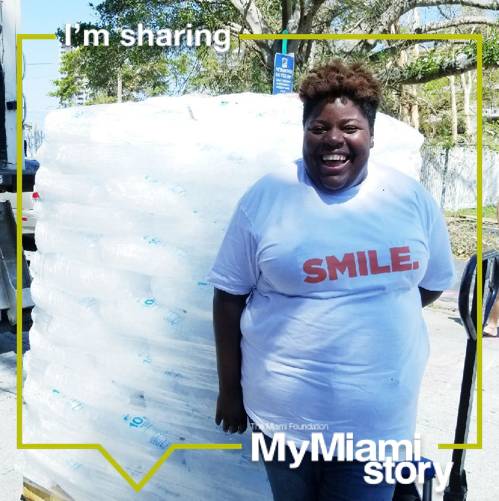 Valencia Gunder, founder of the nonprofit Make the Homeless Smile, knew her neighborhood would need help preparing for a major storm. A few days before Hurricane Irma, the Liberty City-based leader and community organizer began keeping neighbors informed of hurricane updates via social media and shared Google documents, then hit the ground running with friends. Together, they helped people purchase supplies and board up their homes. She called her mentor, Pandwe Gibson, executive director of EcoTech Visions and a Foundation trustee, who let Valencia turn her warehouse into a “Community Emergency Operations Center.” After Irma, she amassed a small army of volunteers, which grew through social media from five to a few hundred people. With support from The Miami Foundation, Knight Foundation and others, they provided more than 20,000 meals to some of Miami’s most vulnerable communities. Valencia is planning to tell her story and lessons learned during The Miami Foundation’s My Miami Story conversations on Oct. 17th as a host, where people from around the county will get talking about how we can shape a more resilient Greater Miami. She shared her Irma story with us, starting two days post-storm. I told everyone to meet us at the Community Emergency Operations Center at EcoTech. We scraped up what we could and went to the stores. We went to Publix for supplies and a local meat store. We got some hot dogs and a few bags of charcoal and I took the small grill from my house. 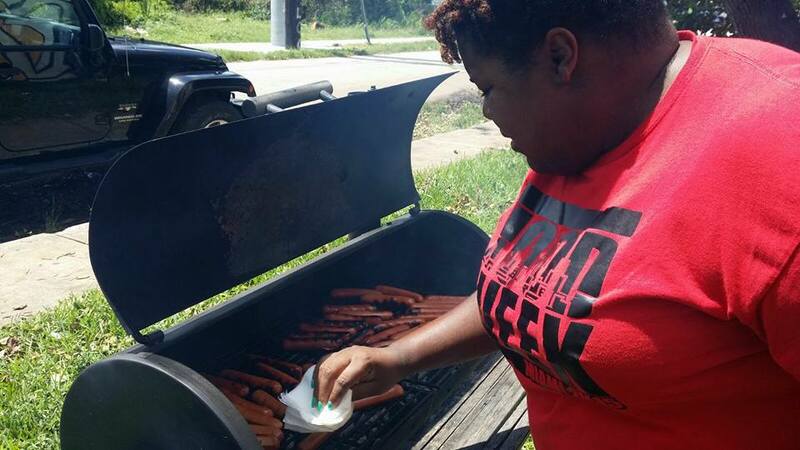 We went into Liberty City and we started grilling and feeding people. When we first got there, people were crying because they hadn’t eaten since before the storm, some for two to three days. Grown people were crying. Kids saw us coming and they ran up to us. They were happy to see us. They were blown away that we were giving away free food. 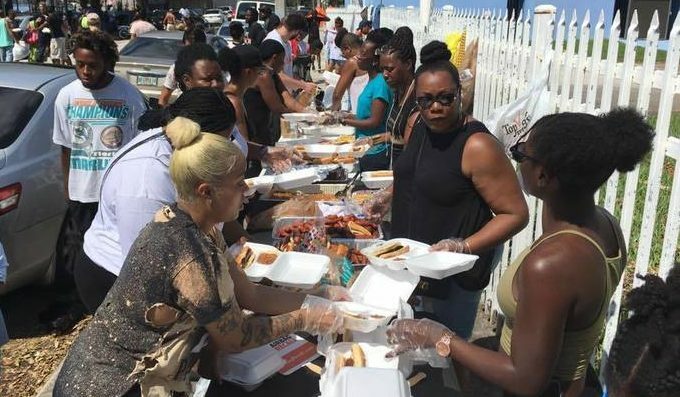 We gave out hot dogs, chips and bottles of water, and then we went to Little Haiti and did the same. We set up on a corner and volunteers walked down the streets. For those who couldn’t walk up to us, we brought them food. There were elderly people who were too weak to get out of bed or even feed themselves, and volunteers fed them. The next day, we went to Overtown and Little Havana. Language wasn’t an issue. Race, ethnicity, none of that. We were in Little Havana and I speak no Spanish, but they understood that we were there to help. That’s all that matters, right? We went to two neighborhoods a day, feeding 500 to 600 people a day, maybe more, depending on how much stuff we could buy. Volunteers started to chip in, but honestly, everybody was broke. It was Wednesday afternoon and I was standing in Overtown, and I got sad. I thought, “We’ve got more people to feed.” We hadn’t even gotten to everybody and my phone was ringing, it was ringing a lot. On Thursday, I reached out to Chris Caines, interim Miami program director at Knight Foundation, and I just told him, “I know this isn’t proper protocol. This is not how it works. But I really need some more money. I am broke now.” At this point, every credit card I had was maxed out. The banks were still closed, I didn’t have any money and all my volunteers had given what they could. I didn’t want them to go broke. They had themselves and their families to feed. So when Chris told me “yes,” that within an hour he could help, I was relieved. Both Knight Foundation and The Miami Foundation helped get me some funds and Vous Church wired me money that day. I was able to go shopping then. Holy Cross Lutheran Church in North Miami also emptied out its walk-in freezer and we upgraded from hot dogs to sausages and chicken. We were able to feed way more people. We went to Allapattah, Florida City, Perrine and West Grove, and we still kept going back into the other communities we’d already gone to. I have friends up in Fort Pierce, Tampa and Orlando and they started doing the same in their communities as well. The impromptu community barbecues became a state-wide thing. As of Monday, September 18th, we had provided more than 21,000 meals to the people who needed it most. I’m willing to do this over and over again for my community because I love them like that. But it’s tiring and emotionally draining because I don’t have the resources to do this over and over again. I have one question: Miami has this nickname, the Magic City. But who is the Magic City magic for? Because in my community, it’s not magic. We have to understand we have a large low-income and impoverished community that must be addressed. We can’t keep functioning the way we function. There are elected officials who get it. I know the community gets it. Everybody has to get it. We all have to cross our different silos – churches, mosques, gay, straight, white, black, Latina, Haitian. We have to put all of that to the side to help people. That’s how our community should always function. I want to see us reevaluate every emergency response plan in Miami-Dade County so that next time – and there will be a next time – we’re ALL better prepared. People’s first need is food and water, and we need to be able to identify and assess that immediately. On October 17th, I’m hosting a My Miami Story conversation, where I’m going to get some of the resident leaders who greeted me in the neighborhoods after Irma together so we can talk about us creating emergency response plans for our communities. We need to start talking about solutions, and we need to start talking now. We can’t afford to wait. Be a part of #MyMiamiStory by signing up to host a conversation, or join another, at MyMiamiStory.org. Valencia Gunder is founder of Make the Homeless Smile. Marika Lynch also contributed to this story. Thanks for your question! My Miami Story conversations will be held throughout the day on October 17th in various parts of the county. If you’re interested in joining a conversation, you may sign up at mymiamistory.org — we’ll send you a list of all the open conversations in the community for you to browse and join. If you have more questions, you may email us at mymiamistory@miamifoundation.org. Thank you for your kindness. You touched many lives and hopefully that will help in the magic we need in this city!